In a very supportive mid-plague gesture a friend gave me cleaning supplies and citrus fruit for Christmas. She created a monster. I’m now a winter cleaning, procrastination machine. I tidied. I sterilized all my coughed-on surfaces. I vacuumed and now I’ve moved on to the bookshelves. I may have to take pictures to prove that my house was organized for once but it is. 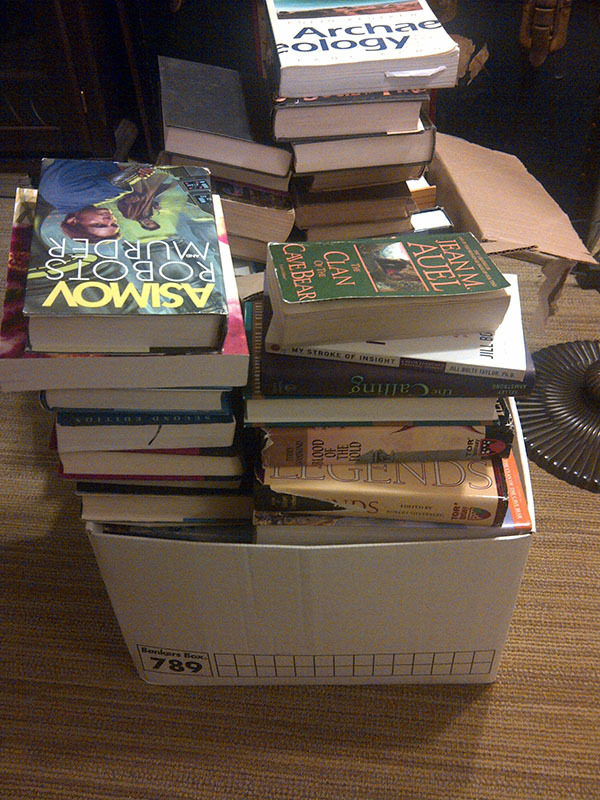 The books I’m keeping are in their place, layers of dust removed and now I have several overflowing boxes of books looking for new homes. I might have to have some sort of book getting rid of ceremony. Speaking of letting go, yesterday I wrote a scene where a woman bludgeoned someone to death with a statue. It was very satisfying. Sometimes I think writing lets me bring out all my crazy bits to stretch so I can pack them safely away for another few months. A healthy way to vent? Tippsy-foo-foo? Who can tell? A friend once told me that her husband couldn’t focus on one thing he wanted to do, leaping into new hobbies and announcing new goals all the time. I think that’s the surest sign of a writer who hasn’t discovered writing yet. I used to dream big, bigger than I could ever possibly achieve. (Did I tell you about my desire to join the army or master Parkour? Seriously.) I would move along a path to pursue my awkward and ill conceived goals and then die a little inside when I realized I didn’t have they physique or frankly the determination to achieve those lofty visions. It took me a long time to realize that I didn’t actually want to do those things myself, I was just trying to live the lives of the characters that were inside of me. I was confusing their goals with my own. I’m a happier person now that I can let my characters pursue their goals watching from the shadows while they scale walls, save the world and bludgeon people to death with statues. I wonder if writing could be a treatment for someone who has socieopathic tendencies. If a person had a good enough imagination could they satisfy their need to kill or commit other crimes simply through the actions of their characters? Maybe they’d be a a best selling crime novelist…or maybe not. Imagine a character who’s been assigned this treatment by their therapist and spend a few minutes exploring their world.